Four Father’s Distillery located on the northwest side of Jacksonville, Florida, opened its doors in 2015 and has recently turned to solar thermal energy to reduce operating costs and greenhouse gas emissions. The XCPC concentrating solar thermal collector technology manufactured in Jacksonville by Artic Solar has made it possible for the brewery to economically use the sun to provide for their steam and hot water needs. Artic Solar has partnered with Energy Laboratories, Inc. and Four Father’s Distillery to provide a solar thermal solution to produce the steam required for the Four Father’s distilling process. 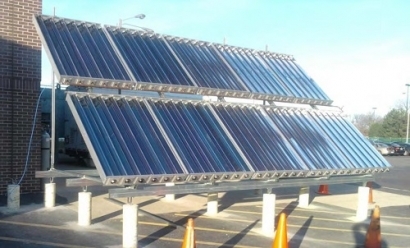 Through the advancement of technology, Artic Solar is manufacturing an advanced, high temperature solar thermal technology capable of generating temperatures up to 400oF for industrial process heat, steam and hot water for food and beverage processing, manufacturing, evaporation and clean water. The secret is the ability of the XCPC to generate heat from the sun in both direct and indirect radiation with no moving parts. At Four Fathers they are distilling spirits with Florida’s sunshine to green up their process.